ABU DHABI, UAE, March 25, 2019 /PRNewswire/ -- Yas Marina Circuit today announced that an array of ticket options for international fans are on sale for what will be its biggest race weekend ever. The season-ending FORMULA 1 ETIHAD AIRWAYS ABU DHABI GRAND PRIX 2019 will run from Wednesday 27 November to Monday 2 December – offering five whole days of on-track and off-track entertainment, and with the fastest ever cars seen in F1®, promises to be a spectacular finale. #AbuDhabiGP 2019 will see the introduction of all-new ticket packages available to the range of international race goers, providing something for everyone and choices to suit all budgets – all providing superb value. 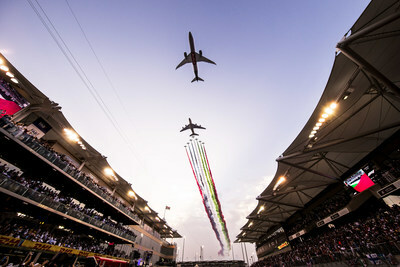 For information on bespoke travel packages, please visit Yas Island's experiencehub.com. Visitors can choose from all-new Grandstand packages with premium seating, plus improved hospitality options that include 1-day Paddock Club™ access. The family-friendly 'Super Parks Pass' package will also return in 2019 and this year has been extended from Wednesday to Sunday, allowing unlimited access to all three Yas Island Parks – Ferrari World Abu Dhabi, Yas Waterworld and Warner Bros. World™ Abu Dhabi. With the #AbuDhabiGP an anticipated, must-see event on the international sporting calendar, organisers will reward loyal fans and those who purchase early by offering up to 30 per cent discounts for those booking before 31st May, allowing overseas guests plenty of time to plan ahead. Al Tareq Al Ameri, CEO of Yas Marina Circuit, said: "We have seen international visitation increasing every year. We are one of the most internationally visited Grands Prix, thanks to our efforts to entertain and excite consumers with a strong destination story as well as our 'modern definition of F1®' positioning. "We are an established fixture on the season calendar with a well-founded reputation for a truly modern and world-class experience. We look forward to welcoming racing fans from all around the world in 2019." Tickets are available online at www.yasmarinacircuit.com.